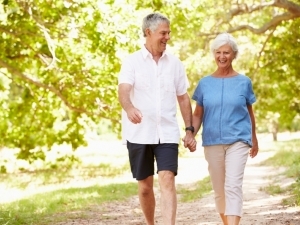 Are you physically active before you reach 50? If yes, then that’s awesome. If not, then it’s never too late to start trying. Exercise offers a lot of benefits to your body. It can lower the risks of several diseases such as diabetes, osteoporosis, and heart-related problems. Being physically active can also reduce menopausal symptoms including hot flashes, sleeping problems, and joint pains. Additionally, regular exercising can help in burning fats and in maintaining proper weight. These potential effects of exercising greatly affect the physiological systems for better functioning and performance. 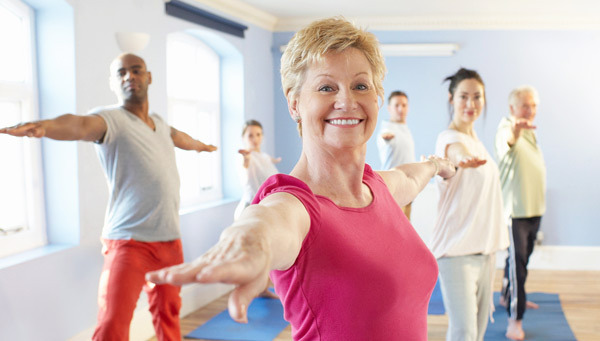 Now, the question is which kinds of exercises are great for women when age. Don’t worry, you can get many choices here. Being physically active is the secret towards successful aging. Regular exercises support the better functioning of the entire body. Here are four types of exercises recommended for over 50 females. As you age, the flexibility and movement decrease due to the changes that occur in the tendons and ligaments of the body. They will greatly hinder your daily routines and tasks. The stretching exercises will improve and strengthen the affected areas, especially the joints, making better and faster movements. This exercise will stretch your arms, shoulders, and chest. In a standing position with feet apart, intertwine your hands behind your tailbone. Gently put your hands up as far as it can go. But be sure to have a nice stretch while having a deep breath to your chest. This exercise will balance your hips and stretches your legs. With the feet together, bend forward and place your hands to your legs. Alternately bend one knee while keeping your legs straight and your head down. This exercise will increase mobility by loosening the hips. In a standing position with your feet together and hands on your waist, move your hips widely in a clockwise movement. Do the same thing in the other direction after 5 times. The older you are, the higher the chances of gaining weight are. This is due to the loss of muscle mass that slows down your metabolism, which in turn leads to high cholesterol and unwanted fats. As one of the proper exercises for over 50 females, the cardiovascular training exercises will help in proper weight loss by increasing heart rate and burning more calories. This exercise enables you to burn around 300 calories per hour. It is a low impact routine that offers weight loss either in brisk or moderately fast pacing. This exercise allows you to burn 1000 calories per hour. It will let you lose weight while walking or running in the workout tool – the stairs. This exercise allows you to burn 600 calories per hour. It is an enjoyable activity that allows you to explore the beauty of nature while losing weight. As you age, there is a decrease in the muscle mass and fibers in the body. This shrinkage causes the muscles to lose their form, leading to stiffness, soreness, and difficulty in functioning. The strength training exercises will help in replacing the lost and damages muscles suffer in order to prevent obesity and other health-related issues. This exercise helps strengthen the upper body. In a standing position with feet shoulder-width apart, slowly raise the weights in front position until your hands and shoulders are aligned. Return to the original position and repeat. This exercise powers the body while maintaining a good form. Stand with the feet shoulder-width apart, squeeze your biceps and position the right fist towards your shoulder. Return to the starting position and repeat with your left fist. This exercise will improve balance, power, and even speed. In a standing position, walk using the balls of your feet while the heels are not on the floor. Repeat this with an interval of a few minutes. As you age, the bones in the body are losing its density and mineral composition, making it more brittle. The menopausal stage can increase the rate of loss due to the significant drop of the estrogen levels. 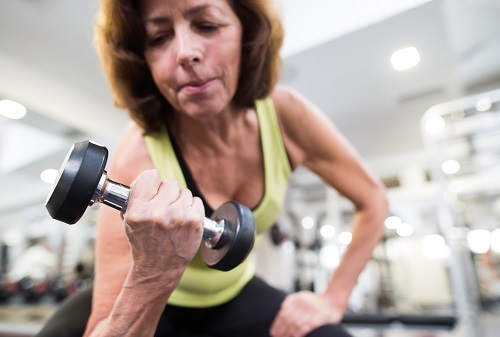 As one of the proper exercises for over 50 females, the bone-building exercises can increase the bone mass to prevent osteoporosis and fractures caused by the deterioration of the bones. This exercise will improve balance and build bone density. In a standing position, step your leg forward while lowering your hips until a 90-degree angle is formed. Maintain the weight on the heels while returning to the starting position. Repeat with the other leg. This exercise helps in keeping the knees and the hips stronger. In a sitting position, let your foot rest in another chair while slowly raising your knees. With the aid of the leg muscles, gently push the raised knee to the floor. This exercise will improve and stimulate bone density. In a sitting position, hold the weights and slowly bend your elbows towards your shoulders. Slowly release and return to original position. Having a pet, especially a dog, will encourage you to walk in the park every day, even for a few minutes. Your pet will be your best companion while doing simple exercises. When you are in the office or shopping malls, feel free to use the stairs instead of using the elevators. If you are calling a family member at home, go up the stairs instead of shouting. Instead of sending emails or using the phone, get up and go directly to your colleagues. Try to have a walking meeting and enjoy the benefits of the outside environment. If you are going to a nearby store or running errands, then walk or ride a bicycle. This will make your feet your mode of transportation. Plus, you can help save the environment due to less pollution. Can I Drink Before Blood Test?